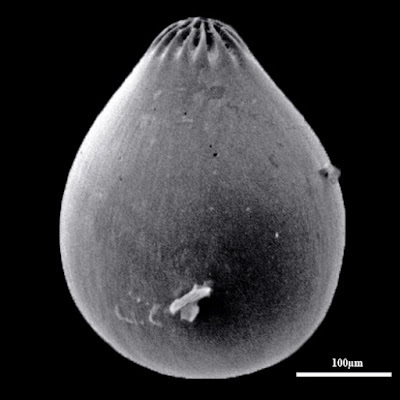 Specimen of Oolina, from Foraminifera.eu. The Glandulinidae are a group of forams known from from the Jurassic to the present, characterised by the presence of a simple internal tube behind the terminal aperture (Loeblich & Tappan 1964b). Characters (from Loeblich & Tappan 1964b): Test unilocular or with chambers in biserial, uniserial or polymorphine arrangement; aperture terminal, radial or slitlike, with simple, straight or curved internal (entosolenian) tube. [LT61] Loeblich, A. R., Jr & H. Tappan. 1961. Remarks on the systematics of the Sarkodina (Protozoa), renamed homonyms and new and validated genera. Proceedings of the Biological Society of Washington 74: 213–234.